osgrid.org • View topic - PARTY FOR OSG NEW OFFICERS!! Post subject: PARTY FOR OSG NEW OFFICERS!! 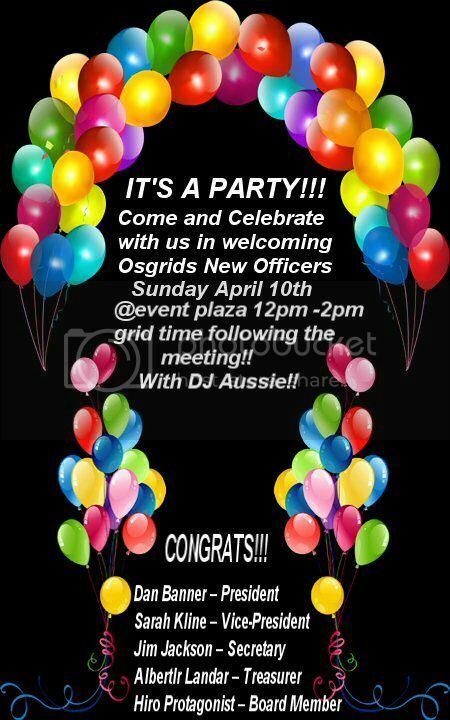 COME AND JOIN IN THE FUN TO WELCOME AND CONGRATULATE THE NEW OSGRID OFFICERS!! SUNDAY RIGHT AFTER THE MEETING !! 12 PM TO 2 PM GRID TIME AT EVENT PLAZA!! !